Topseal packaging gainin... | Packing and Sorting Equipment. Topseal is a new way of packing vegetables, mushrooms, nuts, salads and dried fruit. This method not only reduces the cost of packing, but also gives more marketing and logistics capabilities. What? Read the article. Topseal packaging is increasingly popular and has become standard on the UK market over the last few years, for packing both fruit and vegetables. “The most important arguments in favor of this trend are, above all, the decrease in packaging waste and the increase of marketing attractiveness for the product. Packed products are visually appealing and fruit and veg with high quality packaging are considered to be a premium product by consumers. The advantages from the logistics point of view are also important – tight packaging prevents product spills in bulk cartons, and ensures no interference with the product from outside. Eliminating traditional packaging with lids and flowpack, allows for increased efficiency in distribution and better placement of products on the shelves,” shared Maciej Chmielewski from Polish based Milbor sp zoo. Milbor PMC has been hard at work recently, introducing topseal packaging and machinery to fruit and vegetable traders in Germany and Poland. Along with sorting and packaging machines, they also supply blueberries to European markets such as Germany, the UK and Scandinavia. “This new way of packaging is based on top-down sealing film with micro or macro-perforation. As a result, the products in such packaging remains fresh and it’s shelf-life is extended. 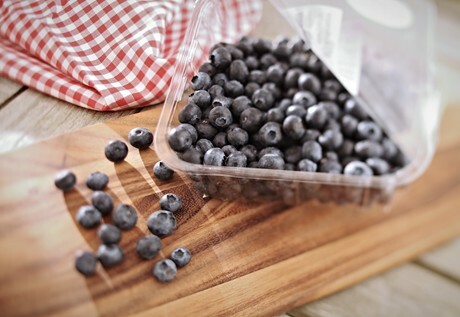 The topseal technology can be used not only for soft fruits such as blueberries, currants, or strawberries, but also for all kinds of vegetables, mushrooms, nuts or salads. Increasingly, topseal packaging is used in the packing of cut or dried fruit,” Maciej continues. Maciej said that topseal packaging is also beneficial in reducing labor costs, along with being a great tool for marketing. Milbor has been a presence at a variety of industry conferences and shows, with the most recent being ExpoSE in Karlsruhe (Hall 1 – stand 1/G-26 ), held next week on the 22 and 23rd of November. Milbor will be there to present their semi-automatic punnet sealing machine together with Packaging Automation and the Blueberry Soft Sorter with WECO Sorting.